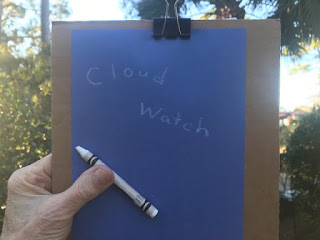 You can spend a lot of money on science equipment for your classroom, or just go outside and look up in the sky and you’ve got a lesson that will intrigue your kids. Clouds, glorious clouds! They change daily and are great way for you students to be scientists as they observe, predict, and record. Ask your students what they know about clouds. 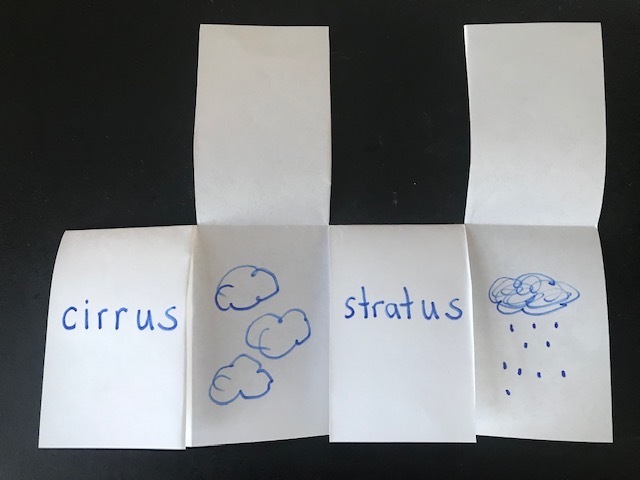 Are all the clouds the same? Why are there different kinds of clouds? Why are most clouds white? This is a perfect springboard for demonstrating how to find new information by searching on the internet, going to the library, asking their parents, and so forth. Give children clipboards, blue paper, and a white piece of chalk. Go out on the playground and challenge them to draw the clouds in the sky. Can they predict what the weather will be? Fold 2 sheets of paper in half and staple to make a cloud book for each child. 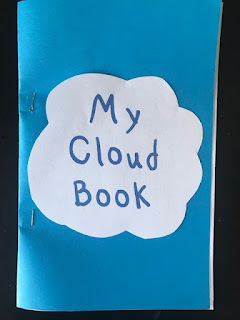 Ask them to write the name of a different cloud on each page and illustrate it. (Older children could write descriptive sentences.) On the last page ask them to name their favorite cloud and tell why they like it. Each day look at the sky and graph the type of clouds in the sky. 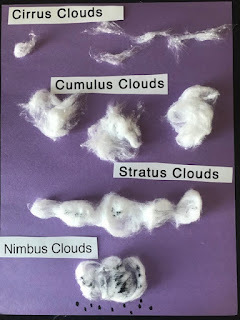 Challenge children to make the different types of clouds out of cotton. Make an anchor chart with the four basic clouds and descriptive adjectives. Look at the sky with your parents. Name the cloud formations that you see. Cirrus clouds look like wispy streaks high up in the sky. If the sky is blue with a few cirrus clouds it’s going to be a nice day. Cumulus clouds look like puffy white cotton balls in the sky. When they turn dark it means it’s going to rain. Stratus clouds look like a dark blanket in the sky. Look for rain or snow when it is cold. Nimbus clouds are dark and have rain or snow falling from them. Can you walk through a cloud? Yes, you can! Fog is a cloud on the ground so when you walk in the walk you are walking through a cloud! Come back tomorrow and I'll tell you how to make a cloud!